Regulation of gene expression is controlled by chromatin environments that are either permissive to transcription or else transcriptionally silent. The formation of heterochromatin, characterised by presence of the protein HP1 and H3K9 histone methylation, is required to establish and maintain cell identity. Heterochromatin is largely absent in the earliest stages of a developing embryo in which transcription is minimal and cell fate is not yet firmly established. Therefore, heterochromatin formation can be viewed as one of the first steps in initiating the transcriptional programme that decides a cell’s developmental trajectory. Although heterochromatin is well studied, very little is currently known about the mechanisms by which the naïve cells of the early embryo establish heterochromatin. Furthermore, it is difficult to use genetics to study the early embryo due to the presence of a large amount of maternally contributed material. In this preprint, Seller et al. use innovative approaches to identify a key factor involved in deposition of heterochromatin, and point towards a mechanism that implicates cell cycle rate in the regulation of this process. The early stages of embryogenesis are difficult to study using classical genetics as a large amount of maternally contributed proteins coordinate the majority of developmental processes before the start of zygotic transcription. These proteins can be removed by creating germline mutants, but this is not feasible if the gene is required for oogenesis. To circumvent these problems, Seller et al. explore a nanobody-mediated mis-localisation system (Jabba-trap). This approach relies on a previously published observation that histone proteins (initially present in excess due to maternal contribution), are stored in lipid droplets during early embryogenesis to overcome toxicity until their redistribution to the nucleus later in development (Li et al. 2012). The authors use a nanobody fused to a lipid droplet targeting protein (Jabba) to sequester proteins of interest to these lipid droplets. The authors use Jabba trap to successfully target nuclear proteins to lipid droplets either when injected into embryos or supplied transgenically. As the nanobody targets GFP, this approach could be used to mislocalise any GFP fused protein of interest. 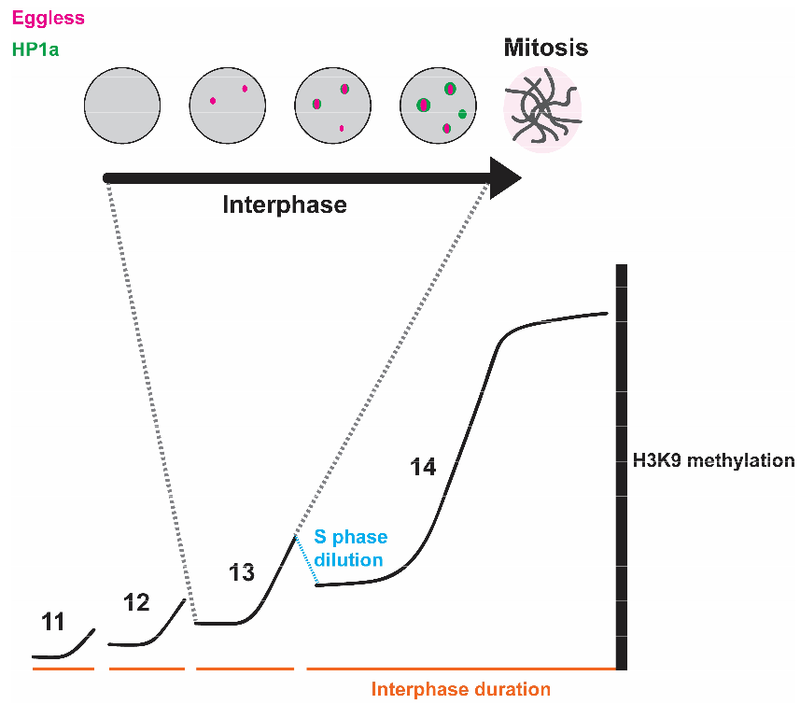 The authors then apply their new technique to the question of heterochromatin formation in early embryogenesis. Of three known histone methyltransferases, the authors observe that one in particular, eggless (egg), is required for heterochromatin formation, whilst the other two (G9a and Su(var)3-9) are dispensable. Satellite repeats associated with constitutive heterochromatin are shown to colocalise with egg and display a loss of HP1 and H3K9 methylation when egg is mislocalised. An egg cofactor, windei (wde) is also shown to colocalise at these regions and is similarly mislocalised when egg is sequestered from the nucleus, indicating that wde forms a complex with egg at heterochromatin. egg localisation in the nucleus preceded HP1 foci formation, indicating that egg is initiating the formation of heterochromatin. 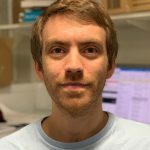 One of the authors’ most interesting findings comes from the observation that more egg protein is seen to accumulate as the length of cell cycles increases during embryogenesis (cell cycle 14 is approximately 6-7-fold longer than cell cycle 11, and a concomitant increase of egg is observed at stage 14). The authors hypothesise that longer cell cycles later in embryogenesis allow for greater accumulation of egg, which therefore allows for the formation of more heterochromatin. This hypothesis is tested by using RNAi against cell cycle regulators to artificially alter cell cycle duration. Shortening interphase resulted in less egg and heterochromatin formation, whereas cell cycle arrest resulted in greater accumulation of egg and corresponding heterochromatin markers. This preprint has several features that I admire. Firstly, the authors have pioneered an innovative approach using nanobodies to mislocalise proteins of interest. This allowed them to study a fundamental period of development that was previously relatively inaccessible to experimental interventions of this nature. This technique is one of several recent studies leveraging nanobodies in creative ways to answer interesting questions (Caussinus et al., Harmansa et al. ), and I think the principles that underlie these techniques are useful to many researchers. Secondly, I am struck by the idea that the slowing of cell cycles is sufficient to kick-start heterochromatin formation at this fundamental juncture in development. Often, I think that as biologists we are predisposed to imagining complex mechanisms to explain our observations. In this case, it is pleasing that an idea as simple as a slowing of cell division could be sufficient to result in a fundamental shift in the gene-regulatory programme of a developing animal. How does the Jabba-trap technique compare to other nanobody mediated methods? For example, what is the advantage of mislocalisation of nuclear proteins over degradation techniques such as the degradFP system (Caussinus et al, 2011)? What is the mechanism by which egg is recruited to heterochromatin regions? Are the physical properties of repeat DNA regions sufficient for recognition by egg? Does egg alone recognise sequence features associated with heterochromatin or is there a preceding cofactor (chicken perhaps!?) that comes before egg? What happens if cell cycle rate is altered by other means? It is well known that the rate of Drosophila development is temperature dependent. If the temperature is decreased, does slowed diffusion of egg result in HP1 recruitment at a proportionally reduced rate? Is early embryogenesis the only developmental stage in which cell cycle speed affects heterochromatin formation? Could increased cell cycle speed or unusual cell cycles such as endoreplication influence heterochromatin later in development? Li Z, Thiel K, Thul PJ, Beller M, Kühnlein RP, Welte MA. (2012). Lipid Droplets Control the Maternal Histone Supply of Drosophila Embryos. Current Biology 22:2104–2113. Caussinus E, Kanca O, Affolter M. (2011). Fluorescent fusion protein knockout mediated by anti-GFP nanobody. Nat Struct Mol Biol. 19(1):117-21.